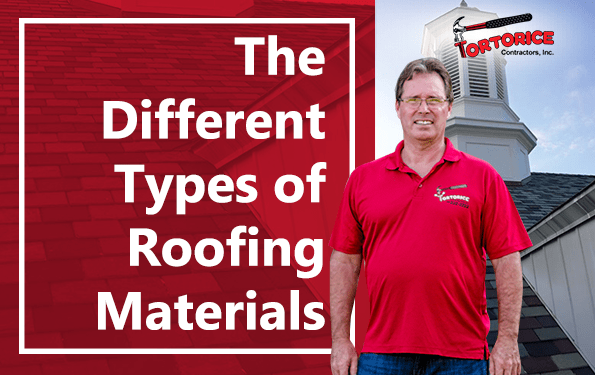 Monroe Township Roofing Contractor: Different Types of Roofing Materials - Tortorice Contractors Inc. There are many different kinds of roofing materials a Monroe Township roofing company can install in your house. They each have different styles, are made from different materials, and also vary in cost. It is important to learn about roofing materials because they can impact future repairs, the value of your house, and your budget. Here are some of the most commonly used roofing materials. Depending on the Monroe Township roofing company, asphalt shingles can cost $50-$150 per square, making it a very affordable choice for a roofing material. Asphalt shingles can last 15-30 years and can be used with most architectural styles. This choice of roofing material is very popular in America because it can be used in different climates. Approximately 75% of houses in America use asphalt shingles as a roof covering. However, asphalt shingles are not a green roofing option. They are made from petroleum products and are not recyclable due to their high fiberglass content. However, it is still a good roofing option because it comes in many different colors, last for a long time, and has attractive price points. Slate is a very beautiful and elegant roofing material. It looks good on French, Colonial, and Chateau style homes. However, it is also very expensive, costing around $550-$1,000 per square. Monroe Township roofing companies recommend slate for homes in cold climates and locations because it is not heavy and will not split in low temperatures. Slate lasts a very long time, sometimes up to 100 years. It is also very easy to repair and recycle. However, slate is not recommended for high temperatures or humid locations because of its dark coloring. Contrary to popular belief, metal roofing is very durable. It comes in copper, aluminum, and stainless steel. It is highly recommended to use on homes in all types of climates and weather conditions. Roofing firms in the Monroe Township recommend metal roofing because it is lightweight and reasonably affordable. A water and rust proofed metal roof can last at least 50 years. It is reasonably affordable, costing around $100 per square. Metal roofs also have a good environmental footprint because they usually contain a high percentage of recycled materials. Metal roofing is a good option for bungalow, ranch, contemporary, and cottage style houses. Metal shingles can be manufactured to look like traditional roof coverings like wood shakes, shingles, and tiles. This is a good choice for people who are looking for longevity, lightness, and weather resistance. Many roofing contractors from the Monroe Township install clay and concrete tiles to Mediterranean, European, mission, contemporary, and ranch style houses. They are around $300-$600 per square and are very versatile and provide great protection for your home. Clay and concrete tiles can last up to 50 years. If you’re looking for green choices, this is one of the greenest options available, especially if you want to buy from local sources. Concrete tiles are energy efficient and can be made from sustainable materials. However, clay and concrete tiles are heavy. They need extra framing to help support their weight. However, on the plus side, they are noncombustible and very durable. They can reflect up to 50% of the sun’s energy making them a good choice for families who live in hot or humid climates. This type costs more than $100-$200 per square, making wood shingles and shakes moderately priced. They are also lightweight and versatile making them a good choice for French, ranch, cottage, bungalow, historic, and contemporary house designs. They come in different types of woods like cedar, redwood, and southern pine. According to roofing companies from the Monroe Township, wood shingles and shakes are green roofing materials because they can be made from sustainable materials. However, this type of roofing material has no fire safety rating and is highly combustible. You can purchase fire resistant wood shingles and shakes but at a higher price. Some Monroe Township roofers do not recommend this material because they are high maintenance and have a tendency to rot and mold. There are also synthetic wood shingles made from plastic that are made to look like their natural counterpart. They are UV resistant, lightweight, fire resistant, and are very durable. Some synthetic wooden shakes can last up to 50 years, rivaling asphalt shingles in longevity. However, they are not recyclable due to them having a high content of inseparable mixtures of biological and synthetic materials. Your choice of roofing material should keep your house cool during hot weather and warm during the cold weather. Remember that the roof is the house’s first defense against the weather. Discuss with your roofing contractor in the Monroe Township your needs so that you can choose the best type of roofing material for your home.